This month's guest for my When we were young series is the talented and lovely Hayley from Welcome to the mouse house. Hayley is a whirlwind sewer, pattern maker, mother to two gorgeous kids, home decorator and a super friendly girl that I have come to know over the past six months. 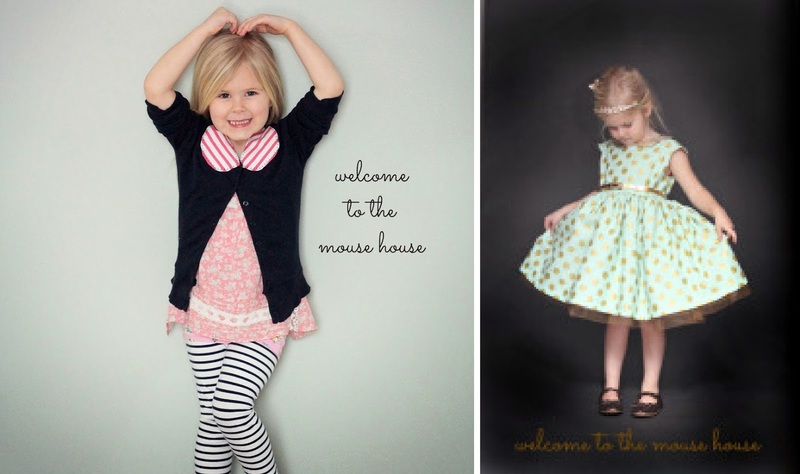 She has her own pattern label, mousehouse creations where she sells some fabulous girls' patterns and to date, one women's pattern too. Her blog has had a makeover and is looking fantastic! She also contributes to the new pattern collective, Willow and Co.
Where were you born/did you grow up? I was born in Queensland, Australia. My dad is from New Jersey and my mum was born and raised in Sydney, Australia. They met in the 1970's when he was on a worldwide vacation to Australia. I was moved to the States when I was 4 years old, but we would go back to Australia often and for many months at a time. Half of my family is still there in Australia, including my brother (he moved back a few years ago). I miss that family very much. I have one older brother, Lucas (Luke). He is 5 years older than me, so we grew up as very different individuals, but he always loved me and wanted to see the best for me. He lives in Australia with his wife Aline. What did you like doing when you were young? Oh man, I loved to do many things. One thing that always makes me laugh is how much I loved to decorate, even as a young child. I would draw sketches of how my room should look. I would bring them to my parents and request a change, and crazily enough, my parents usually obliged and let me turn my dream into a reality. I would dream up how to paint my room, remake the curtains, build shelving, reorganize the closet. These were things I was doing at 8 years old. My bedroom changed more times than I can count and I can't thank my parents enough for allowing me to do that. I also loved to read. I think I read more books than anyone I knew by the time I was 12 years old. Do you see similarities between yourself and your children? Ha, oh yeah. I see me in Ainsley, which is why she drives me nuts, but it also makes me happier than I have ever been. She is stubborn, funny, exasperating, persistent, cute, humorous, creative, and so snuggly. She is me. To a tee. There is no denying she is my child. Then there is Ethan. He is completely the opposite of me. I can't even explain it. I am not sure if it is his Autism or not, but man, he has the biggest spot in my heart. He is the person that made my heart bigger. My heart swells when I think of him. He is so smart, so literal, so completely intelligent. I don't see much of me in him, but I do know that me and Ethan have a special bond. A really special bond. We live west of Philadelphia in a very suburban town and we love it. It is a very good spot for us right now. I did a lot of modeling as a child, and so does Ainsley. The picture on the left is me in 1984 and the one on the right is Ainsley earlier this year. I can see the differences in the eyes mostly (oh, and the bangs!) and the chin, but seriously, either picture could pass for us. Here I am in preschool. Check out those pigtails, ha, but I did consider recreating this look. I love the bright polka dotted shirt with the hair ribbons. Another one I considered was this adorable corduroy jumper. Love the color! I think this was Kindergarten. One thing I was never good at was knitting. I come from a family of good knitters... I think it skipped a generation. Here I am with my brother Lucas. How cute are we? I was born in Australia (for those of you that didn't know that), but this is definitely one outfit I did NOT consider... check out those awesome sweatpants! So, in the end, I knew that the pinafore would be best. I have been making this style for Ainsley for a long time and I just love the classic style. This is one of those dresses that will never go out of style. The original pinafore used a quilted look fabric... basically just a print that looks like a quilt (typical 1980's, right?) but I searched everywhere and couldn't find it, so I actually had to quilt my own! I cut a bunch of tiny squares and put them together to create the looks ( I am NOT a quilter, so this was rather different for me). So, yeah, tons of tiny squares pieced together... a total departure for me, but I think it was worth it to get the look I wanted. Thanks so much for having me! I absolutely LOVED looking through my old photos and realizing how great life is. The pattern for this dress will be available soon, so check back at Welcome to the Mouse House for that! Thank you so much for this amazing post Hayley! You did such a great job on this dress, it is gorgeous!! Thank you for sharing your stories and all your great pics!! What a gorgeous dress for Ainsley! Stitching those tiny little squares was so worth it! You sure were twinners! Love this look! And Hayley I cannot stop laughing at you standing there with a freaking koala bear....and then you focus on the sweat pants...hahaha. You are really the funniest :-) Love you girl! The look you created is sooooo cute and wow you definitely look alike. Loved all the photos of you as a child! I love this series so much! Really, I am always excited when there is a new post... I love to see all the pictures and learn new things about the guests. That is a gorgeous dress, Hayley! Oh wow this dress is just adorable!! And never realised you were born in Australia Hayley! It must be why you are so talented - hahaha ;) Thanks so much again Suz for a fabulous post in this great series. Please keep them coming! Oh, I love all the old photos! And your daughter is such a mini-you, except for that little dimple in her chin (which I loooove!). I love your polka dotted shirt, I must say. But this little dress is a clear winner. This is so priceless! You both have to be the sweetest things ever! And that dress is just perfect! so cute! I can't believe how much hailey and her daughter look alike ;o) Such a sweet dress!! !